OUR PRICE: $22.10 - Join Rewards Get $2 Dance Dollars On This Item! We used to always order theatricals but always had an issue for our dancers with wider feet and then we decided to try Capezio's. 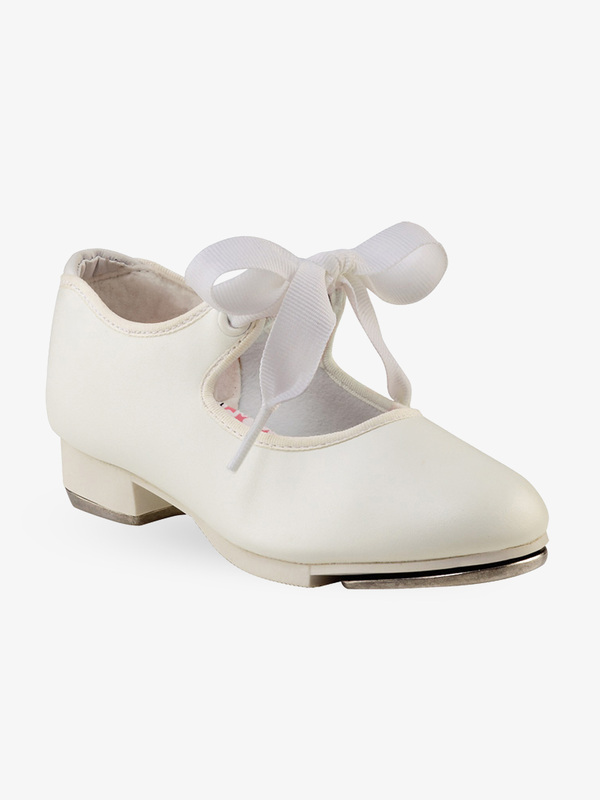 All of our dancers love these shoes, they are more comfortable and they love the little ties. Glad we made the switch and we don't plan on switching back! They seem to be true to size and great quality. They are cute as a button. Good show for a beginner as far a durability goes. Most children are comfortable in them but some do complain, it's usually just a case of breaking them in and they are fine. Never have trouble with the taps staying secure and the sound is really good on them. Only thing is we have had to order 1/2 to one size larger, they run a bit small. These shoes seem to run a bit snug on my toddler's feet. The durability looks great and the elastic closure is very handy for little feet. Overall, a good shoe. These shoes are perfect and are of very good quality. The elastic between the lace holes is perfect. They run a bit narrow, so if your child isn't very very skinny footed, you may want to order it in wide fit. They are very nice and my daughter has not complained of discomfort at all, which was a worry of mine. I would recommend. My daughter loves these shoes! They fit nice and look great! We are new to tap dance, my 4 year old has only had one class so far, but the shoes worked well. She's worn them at home some too, and does not complain about them hurting. We did order a size up to allow for growth, and I think they are true to size. Overall i'm very pleased, especially with the price. Considering local dance stores sold similar shoes for 3 and 4 times that price! This is a great tap shoe. My daughter wears a medium width street shoe in a size 8. So I ordered her an 8 1/2 medium for a little room to grow or in the chance they ran a little small. The length was a great fit but the width was very narrow. I could barely squeeze her foot in them and she could barely walk in them. They pinched her feet pretty tightly. I'm going to try ordering her a wide. Her feet are not wide so I'm thinking this shoe just runs a bit more narrow than a street shoe. Other than that, they looked very nice and I loved that they had an elastic strap. This is the second pair of Capezio's "Jr. Tyette" tap shoes I have ordered. The only reason I bought these is my daughter needs a larger size. These are wonderful shoes! The pair she wore for a year still looks brand new. I will stick with Capezio because it is a great value! I know I will get all 3 of my girls to wear these shoes for their year of dance class! My daughter is 3 & in between sizes (8 & 9) and I was not sure what to order. Over the phone the associate gave me great tips IF the size I ordered was too large. I risked a little larger size (8 1/2) & I was happy with the room to grow but because of the added elastic on top of her foot they fit snug enough & won't fall off! Very happy mom! These shoes came 5 days after purchase. Very quick delivery. While my daughter just received them, the quality is very good and I can tell they will last. There is a non skid surface just behind the tap providing extra grip . I was also pleasantly surpassed that there is an elastic strip under the tie, which is helpful for little girls who can't tie their own shoes. I'm very pleased with the product and will recommend them to a friend. These tap shoes looked great! BUT, my daughter is 11.5 and we ordered 11.5M and her big toe hits right at the top of the shoe. I'm getting these refunded and I re-ordered for a bigger size (13W) because I liked them! Love that this shoe has elastic and string. I would say slightly bigger sized than usual shoe size. We received the order and the shoes are a great quality! 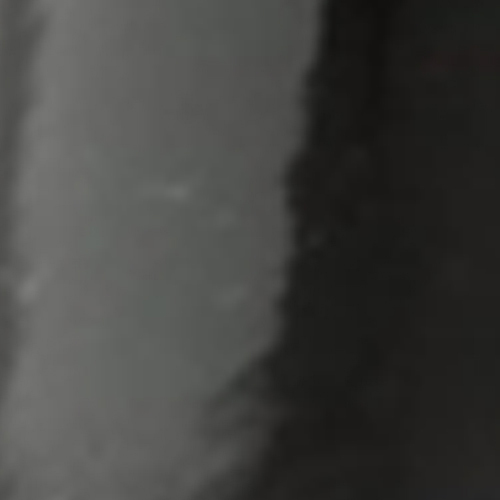 However, they seem to be very tight across the top of the foot. My daughter has a medium width foot, so not sure if a wide would help. I have contacted customer service regarding what size we should order, or if we are going to switch to a different brand. Hoping we don't have to, because these shoes look like a very nice shoe. My daughter has been in dance for 4years and the Capezio's Jr Tyette is the only brand I have ever bought her and it has never let us down. They have a large size selection and It's been true to size (I order the same size as her street shoes) and they offer narrows which means they give my daughter's narrow feet the proper support that she needs. She has always said they are comfortable and they have always held up. 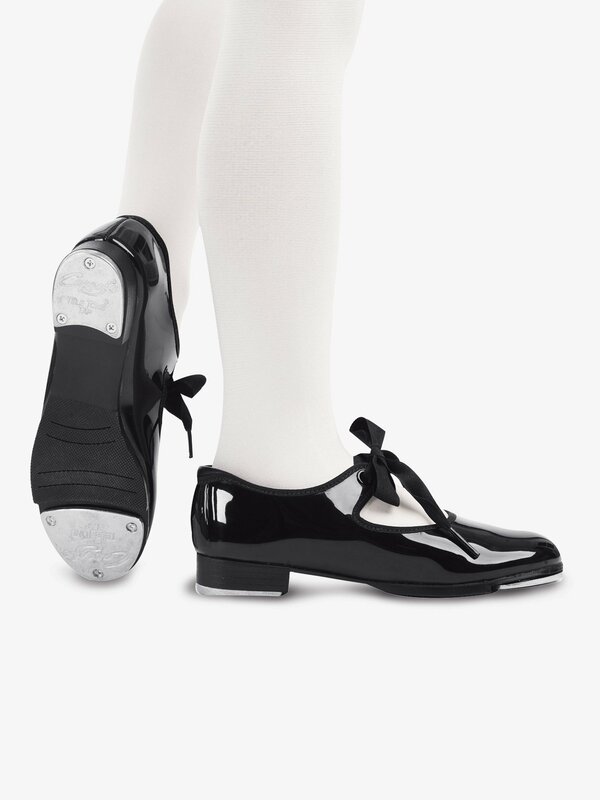 I definitely recommend these tap shoes! This is the second pair of shoes I bought for my four years old. She's 9 to 9 � street size and I ordered 10 � , they leave a little room but still comfortable. The only thing I'm a little disappointing with it's the inside lining: it's black as usual. 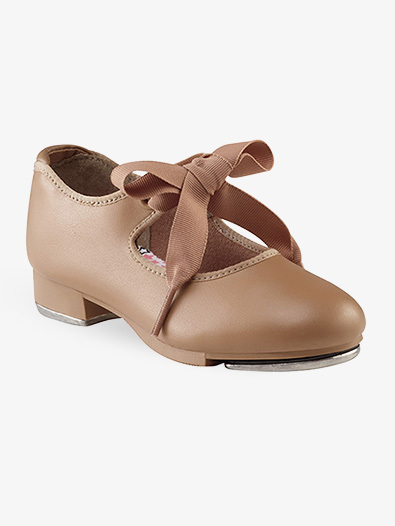 My 5 year old is just starting with ballet and tap and I think these shoes would be great since they have the elastic and the school wants elastic or tap ties (tap ties wouldn't be necessary now - right? ); however I am confused with the sizing. She wears a size 10, but some shoes seem too narrow for her. I am thinking the elastic may give her a little more room? Any suggestions on whether I should order a 10 or 10.5? The elastic should help with some of the width towards the top. However, if it is her toe box that is too wide it may not make much of a difference. If she has a wider foot I would recommend going with the wide width for the extra room. Are the ball taps screw in or are they nailed on? I can tell that the heel taps are screw in, but from the photo it is hard to tell if the ball taps have screws as well. The heel taps on this shoe are screwed on, however the toe taps are riveted to the shoe, meaning they cannot be removed. Does this have the tap elastic under the ribbon? My toddler needs the tap elastic as she cannot yet tie shoes. Does this have the option to remove the ribbon tie? Yes, this shoe does have the elastic under the ribbon.